Just based off the synopsis I knew this was going to be a dark book. I'm honestly not sure how a book about a school shooting wouldn't be. I deeply admire Marieke for writing about such a sensitive topic, not everyone would go for it but she did and I have to at least give her props for that. However, I didn't really enjoy reading the book. This book is actually told from multiple POVs, and by multiple I mean like 5 POVs. I don't know about anyone else but that's a lot of different perspectives for me to keep up with. For the first 20% of the book I was straight up confused. I was having a lot of trouble visualizing the character's appearances, which was mostly my only problem with the multiple POVs. You know how sometimes when there are multiple POVs you tend to favor one over the other (at least that's what I tend to do.) There was none of that in TIWIE but that was more due to the fact that I didn't particularly like any of the characters. Throughout the book there are several flashbacks. Some involving the shooter, Tyler, and some just being being family moments. I assume the flashbacks were there to help move the story along as well as give you a reason to be attached to these characters, since you barely see them. However, I just didn't feel anything for them. Of course I felt bad when someone died or when someone lost a love one but it wasn't because I liked that character it was more because that's my nature, being the human that I am. It felt as if the story got slightly repetitive in some places. After the third time of someone saying "I need to go protect ...." I was just done. Going along with the "I need to protect..." I thought that some of the characters were just being straight-out stupid. The shooters sister, Autumn, repeatedly tries to go confront her brother and every single time he shames her and threatens her life. You can't reason with someone who is INSANE. Some people believed they were being brave by standing up to the shooter, and maybe that's true, but it was also a pretty stupid thing to do. Looking back, if things wouldn't have gone the way they did then the ending wouldn't have been what it was. (If that makes any sense xD) I guess I could understand some of the characters actions but that wasn't always the case. Since this book is focused on a sad, modern occurrence it wasn't hard to predict the ending. As soon as you read the synopsis you theorize about how it will end, and let me just tell you it ends exactly how you think it will. 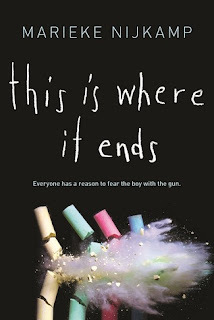 There are no plot twists or betrayals just a crazy teen with a gun that decides to go kill innocents. I thought this book was okay overall. It didn't particularly blow me away and when I was done reading I felt like I needed to see cute animal GIFs. "I never realized courage was so terrifying." I'd recommend this book to: People who like contemporaries about more serious subject matter. I really liked this book! This is the only kind of contemporary book that I like to read. The tough issue type ones. I reviewed this book a couple days ago. I feel like the characters would be more likable if you got to know them over the course of longer than 54 minutes. I thought that the whole thing with Tomas and the girl was a weird thing for him to be thinking about at that time too! It's too bad you didn't like this book more, but great review! I had the same issue involving multiple POVs with a book a just read. It had SEVEN povs. It took me quite awhile to really GET each character squared away, i mean, once i did the book was good but i definitely understand where you are coming from. Not sure if i'll be picking this one up, but great review!